Techcrunch recently reported that Wefollow was acquired by Digg. The founder of Digg is also the founder of WeFollow. We follow organize twitter brands by category ( i.e. Caribbean); most followers and most influential. I am proud to say DancehallSoca was in the top 15 most influential for the category "Caribbean" and top 5 for category "Dancehall". This fluctuates from time to time. I am unsure of how they get this information. My guess is that the person with most relevant twits in some combination with followers may make it on this list. 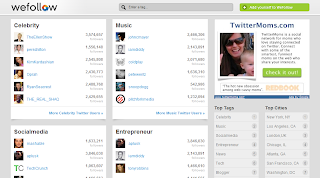 As Wefollow become more popular and is infused into Digg, it will be interesting to see how this list changes. In order to be listed on WeFollow, you will have to add yourself.